My body is SO dry. It doesn’t help that I sometimes neglect my body care routine. I do my face religiously every day and every night but in winter, when your body is hidden under layers of clothing, it’s easy to neglect it, ya know? In the past, I’d try every lotion and potion under the sun to no avail. They’d moisturise my skin for a couple of hours and then back it went to Sahara dry. Then, I found it! The magic ingredient that keeps my super uber dry skin soft and smooth all day long: Shea butter. I kid you not, these days I never use a body lotion that doesn’t have a huge dollop of it. I just know it won’t work. What The Heck Is Shea Butter? Shea butter is a fat derived from the nut of the Shea tree. Shea butter is rich in moisturising fatty acids, including oleic acid, stearic acid, linoleic acid, palmitic acid, and linolenic acid. Plus, it has its fair share of antioxidants, too. It’s the fatty acids in shea butter that makes it such an excellent moisturiser. Shea butter works by creating a protective barrier on the skin that slows down water loss. 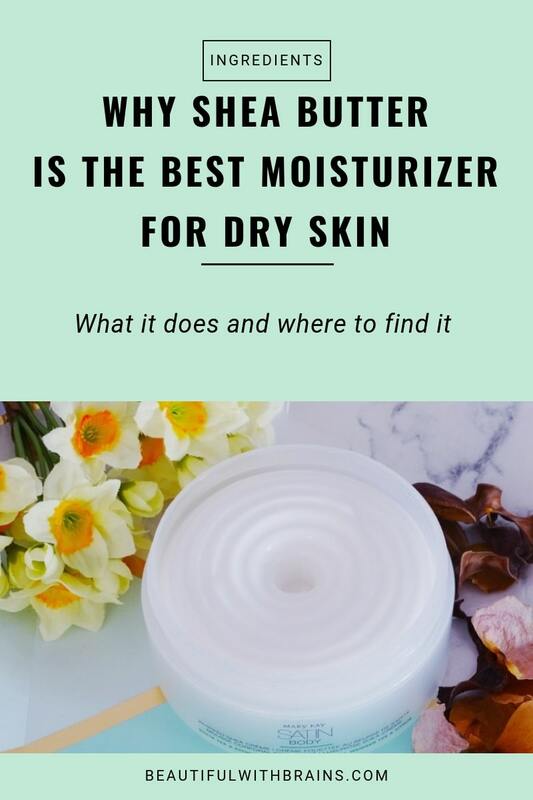 According to a study conducted by AAK, it does this even better than mineral oil, one of the most moisturizing substances on the planet (hate it all you want, it works). Now, it’s true AAK makes shea butter so they may be a little biased. I usually wouldn’t cite a study like this but, in this case, I think they have a point. I used both lotions and body butters with mineral oil and shea butter and the latter always worked best for my dry skin. Just saying. A clinical study conducted by F. Renard as part of his doctoral thesis suggests that shea butter may also have anti-aging properties. 30 volunteers, aged 29 to 82, applied shea butter daily on their skin for 4 to 8 months. The results? Skin looked smoother and clearer, and wrinkles from photoaging “are visibly diminished in half the volunteers”. In addition, shea butter helped regenerate thinning skin. Renard thinks this is because of the unsaponifiables in shea butter, which are known to boost collagen production. Again, this is only one study. We need more before we can say for certain shea butter can fight wrinkles. But if, like me, you need to use shea butter to treat dry skin, this would just be a bonus anyway. The Body Shop Shea Body Butter ($21.00): available at The Body Shop andUlta. Haus Of Gloi Pumpkin Butter ($4.50): shea butter + pumpkin seed oil. Available at Haus Of Gloi. Paula’s Choice Clinical Ultra-Rich Soothing Body Butter ($19.00): available at Dermstore and Paula’s Choice. Shea Butter is a staple in my skincare routine. It’s the best moisturiser I know and may even help keep wrinkles away. Do you use shea butter for dry skin? Share your experience in the comments below. Yep, I’m a fan of shea butter, too. I like to see it in my body lotions. Trisha, it’s awesome, isn’t it? So moisturizing! I just tried a sample of Jergen’s Shea Butter Body Lotion, and I was amazed at how much i liked it. After I had some surgery a few years ago, I bought pure shea butter but it was very greasy. So I was particularly interested to read your statistic about the effectiveness of a 5% concentration of shea butter because I wasn’t sure previously that there was enough shea butter in many body lotions or butters to make a difference. I love coconut so I will look for The Body Shop’s entry. The one you’re using, Depravity, sounds great. I’ll have to see where it’s available. Allison, if shea butter is one of the first five ingredients on the label (and it usually is), then there is enough of it to keep skin moisturized for hours. 🙂 And it does that so well! On its own, though, it’s not that pleasant to use. Too greasy, I agree. Gio. I just came back from Ulta, and I checked out The Body Shop butters. The coconut body butter was divine, but it looked like it was different from the regular Shea Butter body butter. I sampled them both, and I will buy whichever one has more shea in it when I finish up two jars of body butter I currently have. Also, I bookmarked the Haus of Gloi website. I see what you mean! I’m very interested in their fragrances so I am sure I will get something(s) from them! Thanks, this post comes in handy for me! I have very dry body skin and sometimes I use some oil to help my body moisturizer. Now I’m finishing nuxe oil which is ok but expensive and I was thinking of buying almond oil to replace it, maybe I will buy something with lots of shea butter instead. Thank you!